How many times have you heard someone say that you need to use the right tool for the job. Most things work best we they are used for the purpose for which they were designed and made. The entire created universe is the same way. Most reading this would agree that that Jesus was used by the Father to create the world and everything in it. But we need to know why the universe was created if we are going to know how to use it. 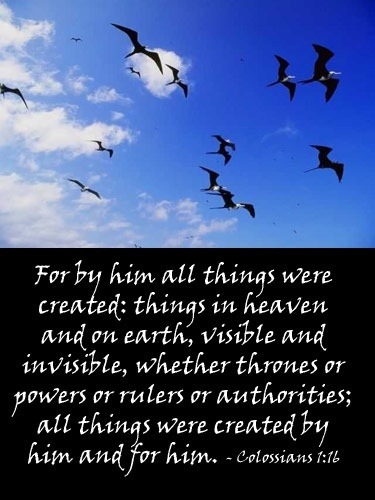 First, we need to believe that Jesus made all things. Second, we need to establish how Jesus made all things. They creative force that was used was the very word of God. Thus the creation story if marked by the phrase, “and God said, let there be” and creative events occurred (the real Big Bang). And finally, the question of why everything was created. Was it for mankind’s enjoyment? Was it because God was bored and we are an arts and crafts project? Of course not. All things were made for His pleasure. What this means for us today is this. Whatever exists for us to use must be used in a manner consistent with the will of God. Anything we use that does not bring glory to our Lord and Savior is being misused. Everything that we can see was designed to bring glory to God, and we must be diligent to make sure we use them in such a manner that brings Him pleasure. Stop and think about that for a minute. What things do we see in nature that are being defiled and thus prevented from their designed use of glorifying God? Are we misusing what God has designed, like DNA, in ways that are contrary to the purpose of its Grand Designer? Let us remember who really owns this world and use it for His pleasure. I got a lesson here today. So much of the time I have the unconscious thought that G-d is here for me when the truth is, I am here for G-d.